Exclusive, high grade ingredients such as airy peat moss and different types of tree bark (as a substitute for perlite) are components of CANNA Terra Professional Plus. They have an antiseptic effect and increase aeration qualities. This has a direct result in promoting exceptional root development and formation of thicker stems. The medium is also pH-adjusted for long-term control with a lime charge large enough to last an entire cycle. It has a mineral-nutrient starter charge that adjusts the initial level of nutrients up to a good beginning charge, correcting the ratios to work perfectly with CANNA TERRA nutrients. 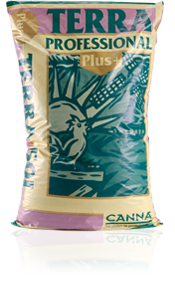 The plastic packaging material of CANNA Terra Professional is 100% recyclable.